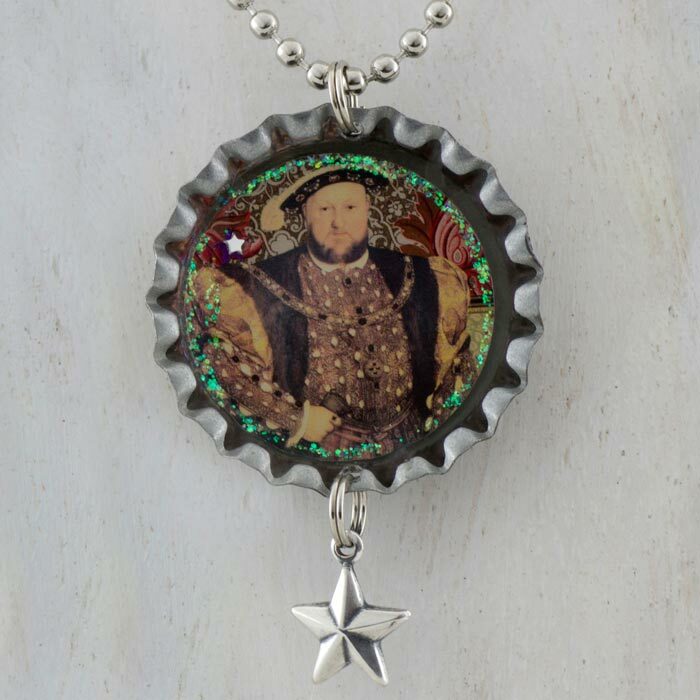 This beautiful, unique and collectible bottle cap style necklace features a Tiffini Elektra collage of King Henry VIII holding The Tudor Rose with pieces of ornamental papers and antique bookplates. These handmade bottle cap necklaces are a fun way to accessorize, with a unique image in each one. The inside of the bottle caps are - one of a kind - decorated with gems and glitter. The miniature photograph is protected by a durable, archival resin that safeguards the image from water damage and fading. The Pendant comes with a 24 inch nickel plated silver bead chain that you can easily cut to your desired length. Packaged with care in a lovely eco-friendly 100% recycled gift box.